When Don Helnore took over the wrestling program at Denair High School six years ago, he had three athletes on his team. Two of them were girls. He knew he needed rekindle interest and recruit students, or the sport was in danger of being eliminated. Fast forward to this past season. There were 21 athletes on the team – all freshmen, sophomores and juniors. The Coyotes finished third in the very competitive Southern League. Six wrestlers advanced to sectional or regional competition. The work Helnore has done to rebuild the program has gained respect and attention. The Southern League coaches voted him Coach of the Year this season – an award that most often goes to the league champion. More importantly, there is enthusiasm and energy associated with wrestling that was not there before Helnore was hired. “He’s worked extremely hard at turning around our program. There were not a lot of students when he took over,” said Denair Principal Aaron Delworth. Helnore said he was able to convince 11 students to resume or take up wrestling in his first year. He also has developed a strong feeder program at Denair Middle School. 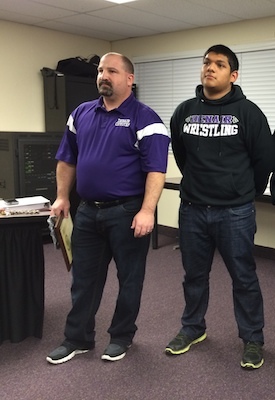 In most years, six to 10 freshmen join the high school wrestling team. “He’s spent a lot of time involving the middle school kids and building a program that goes right into high school,” praised Athletic Director Steve Doerksen. The past season’s team – with six juniors, six sophomores and 12 freshmen – finished 6-4 in dual meets and 2-2 behind Mariposa and Waterford in the Southern League. “We weren’t very competitive until the last couple of years,” said Helnore, who expects another strong freshman class to join the Denair team next season. Helnore has a full-time job as an IT consultant in Turlock and Denair. He credits his assistants – Matt Saldana, Ron Martinez and Joe Prock – for their work in building the program. The coaching staff has ambitious plans for an off-season conditioning program. Posted in News and tagged Denair High School, Denair Middle School, Don Helnore, wrestling.